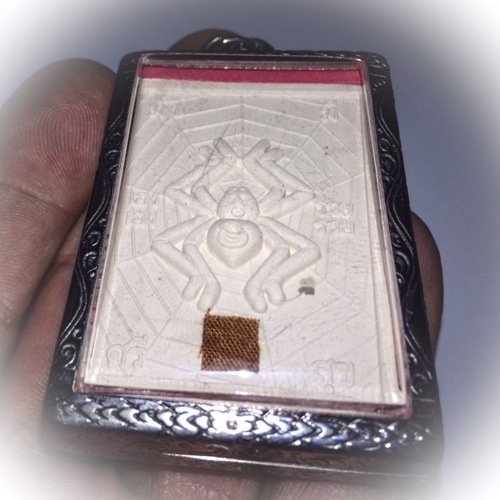 Taep Jamlaeng Butterfly King Amulet in Glazed Color front surface, and white sacred powder rear face with the Maeng Mum Maha Pokasap money spider. 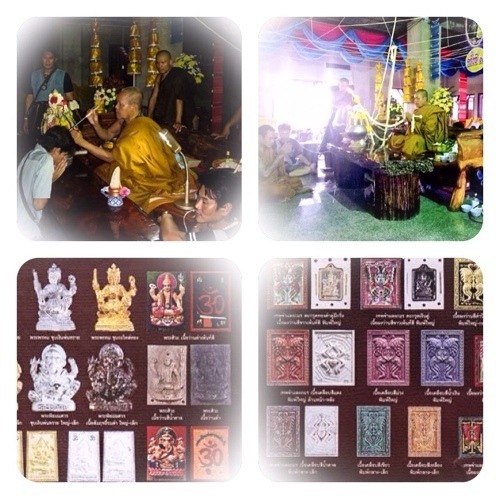 These jumbo size Taep Jamlaeng Butterfly King Amulets were released in the ‘Maha Taep Bandan Choke’ (Deva bestowing Luck) 2556 BE Master Day ceremony, of Kroo Ba Krissana Intawano at Wat Weluwan, in Buriram. 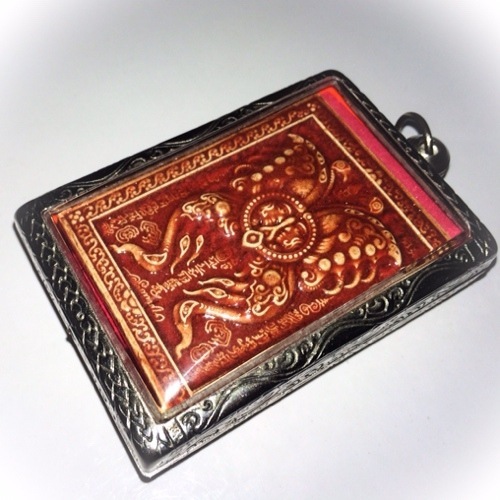 The Taep Jamlaeng Butterfly King Amulet, is an Animistic Occult Charm, used for Maha Lap lucky Fortunes, amd Maha Pokasap Treasure Accumulation. 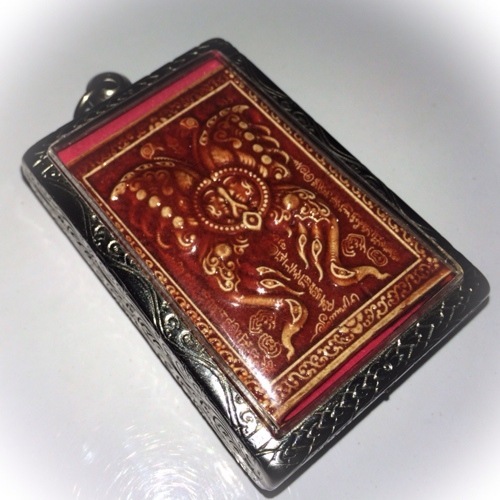 The amulet is made in the form of sacred powder pressed image in Super-Jumbo size at 5 x 4.5 Cm, encased in stainless steel casing. Front image features the Taep Jamlaeng Butterfly King, which is a twin sexed Yab-Yum like spirit Deva of Love. The rear face, features a money spider, weaving its web and sitting comfortably in the middle to trawl in all its prey, and treasures. Spiders don’t have to exert much energy (after their web is woven), in order to catch food, for it just sets a trap and lays in waiting. 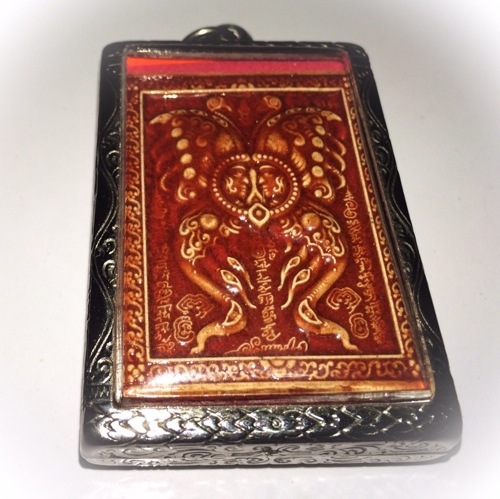 This brings the attractive magic to accumulate treasured possessions in, with powerful and ancient animist Invocations, dating back thousands of years, from Pre-Buddhist times. 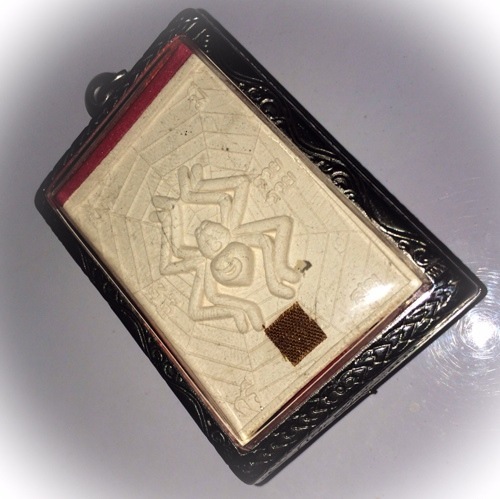 The money spider has been a Magical image of luck and wealthy fortunes, in almost all countries and cultures, around the world since days of old. Sorcery was eliminated in the Western World after the Witch Hunts, leaving almost no real authentic magical lineage remaining. But in South East Asia, Sorcery has survived in its entirety up to the present day, without its authenticity becoming lost, and is still very much a real and living magical practice. In the west, the money spider remains but a verbal allusion, but no true magical empowerments, or invocations exist in the Western World. A piece of Kroo Ba Krissana’s Civara monk robe is attached to the amulet, as a personal blessing and object of faith to the Guru for the continuous empowerment through the faith and trust of the devotee, in the Guru. 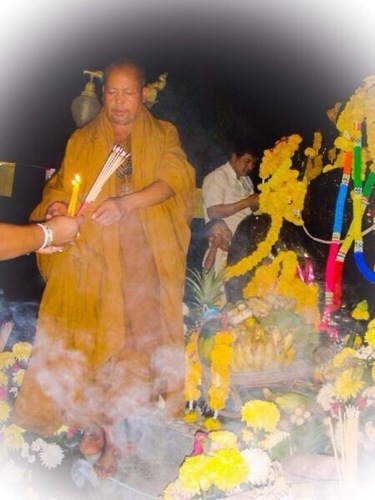 In the Far East where Buddhist and Animist Sorcerors are permitted to practice and not scorned,the imagery does have true and ancient methods of empowerment, and Kroo Ba Krissana Intawano is one of the most favored Masters for empowering amulets with Maha Lap and Maha Pokasap power for luck, Wealth and Treasured Possessions. 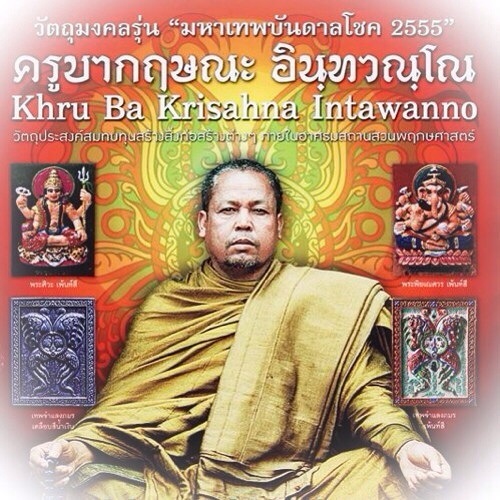 Kroo Ba Krissana Intawano is one of Thailand’s most sought after Masters for his beautiful miniature fine art in the form of his amulets, which are both aesthetically pleasing, as well as full of Metta Mahaniyom Maha Pokasap amd Maha Lap Magic. Kroo Ba Krissana Intawano is also an accomplished Sak Yant Master, who is less known for his Sacred tattoos, than for his amulets, which is in truth only so, because of the ultra high profile amd international attention that his amulets have recieved, overshadowing his other accomplishments. This edition was spearheaded by the issue of Pra Pikanes (Ganesha) and Brahma Images, as well as the classic Taep Jamlaeng Butterfly King. 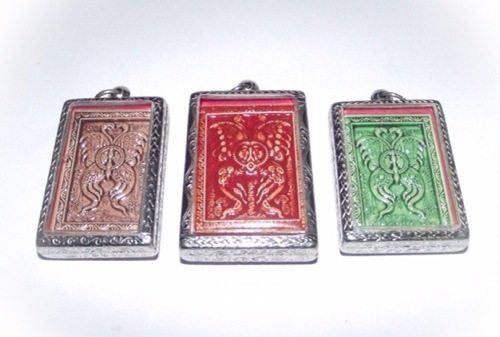 A series of Occult charms such as Takrut and Meed mor knives, and Kumarn Tong were also released. 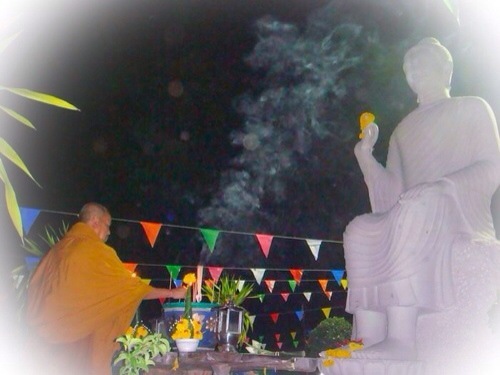 Kata Bucha Taep Fa Din Jamlaeng Pamorn (Butterfly King). The glazed versions were made in Jumbo and also this Super Jumbo size.